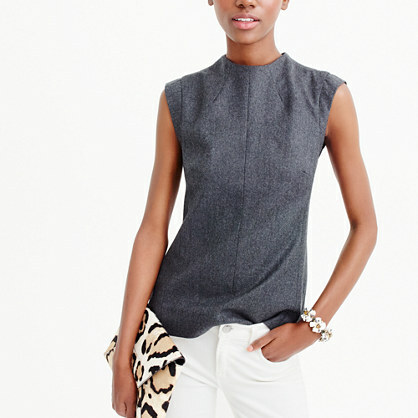 So I admit that the J.Crew Collection Italian Wool Mockneck Top was one of those tops that I didn’t notice through my first (or second, or third) pass through the new arrivals section of the J.Crew website. However, after reading several comments on the J.Crew Aficionada blog referencing this top, I decided to try it before it sold out. I have been gravitating more classic pieces lately, trying to be a little more dressed up at work and I thought this might work nicely in my suiting wardrobe. The purchase turned out being a good call, since it promptly sold out in most sizes, but keep an eye out as I have seen sizes coming and going so you may watch the website for a popback. Not being sure about fit, I went with my usual J.Crew blouse size of 12. Out of the box, this top was immediately impressive. It is lined, soft, a heavier wool flannel. There are a few small vents on the side and the darts and seaming are beautiful. The zipper on the back starts a few inches up from the bottom hem all the way up to the top of the mockneck. I made the mistake of first trying on this top after work, after I had already changed out of my work clothes, and I was wearing it with a pair of sweatpants. Meh. It was boxier than I expected, loose through the bust which surprised me. 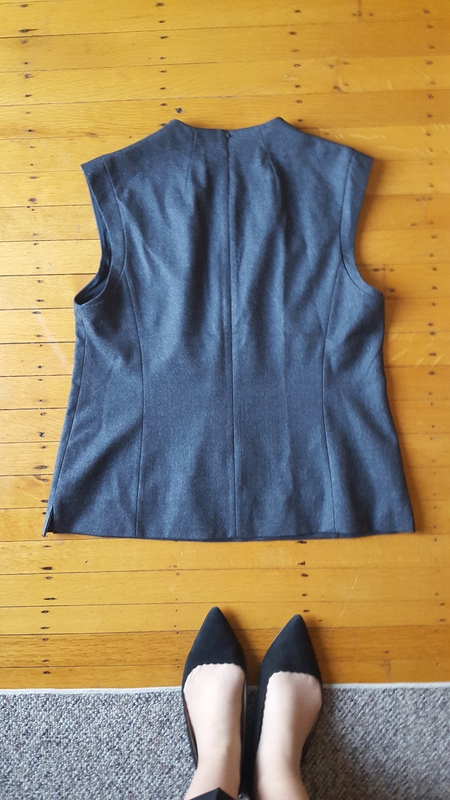 It is definitely a different silhouette than I am used to wearing but I knew paired with a pencil skirt or pants that this top would look elegant and it’s unique shape would stand out. I knew it would also need a necklace to complete the look. I may even prefer full length pants if I were wearing just the sleeveless top. Then I realized that it is December, and although we’ve had pretty mild weather, I’d probably freeze at work. 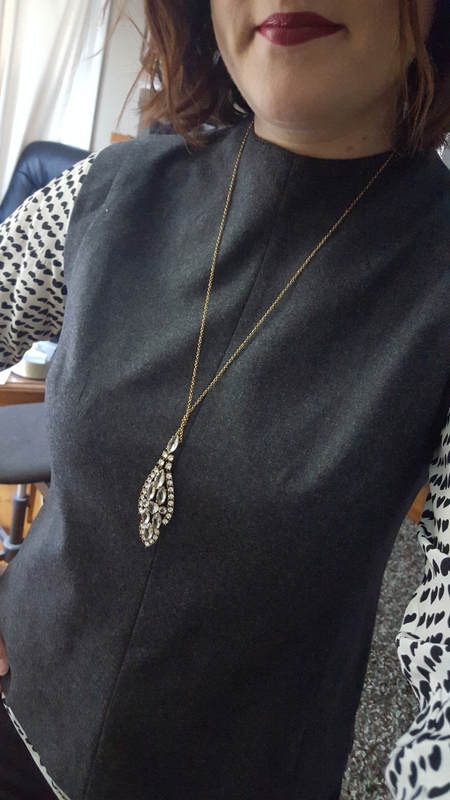 I didn’t try a blazer with this but my first thought was to layer a silk blouse underneath and add a pendant necklace. And we have a winner! I felt so put together in this top. 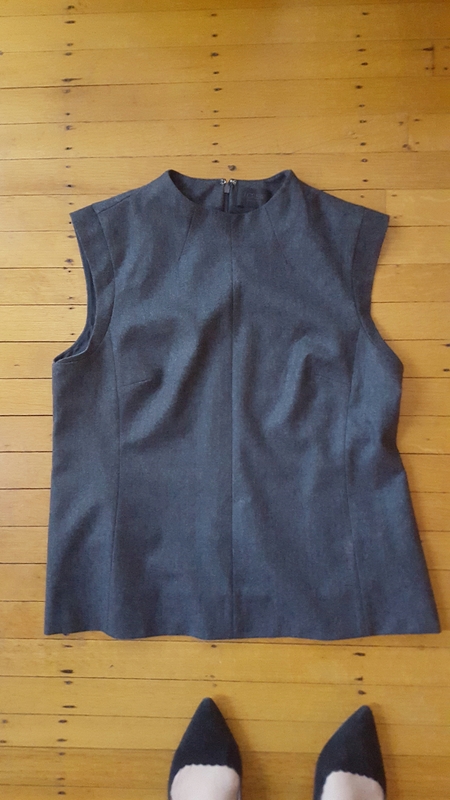 I admit I was unsure of the higher neck at first and wavered if maybe I could try a smaller size (not that there was a smaller size in stock to choose from) but I decided that I liked the slightly loose fit and the existing shape of the top made up for the slightly loose fit of the top. So if you are between sizes, you may be able to get away with going down a size. 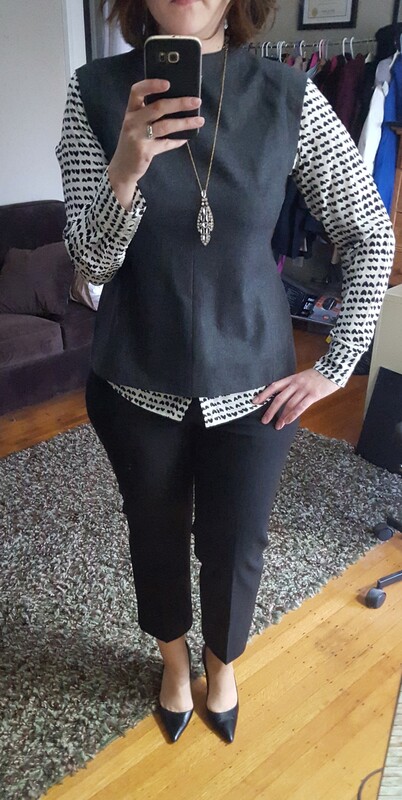 I tried the top as well with a pair of ivory trousers similar to the look on the model and also liked that look. I think for winter I would tend towards layering this top but in warmer weather could see wearing it solo with full length pants. I still have to play around with a blazer pairing, I’m worried that layering a blazer over it will lessen the look of the top and the top will get lost under the blazer. Would love to hear what you think and thanks for visiting! Super cute, Anne! I love how you styled it, as well.